Using the technology behind my hugely successful product VectorPress, I’ve managed the impossible. By that I mean, getting realistic watercolor effects in Illustrator. All you have to do is choose 1 of the 20 watercolor textures, click play and you’re done. It’s literally that easy. The effect also adds inconsistent edges to the type, like you would get when working the paint to the edge of the water. At the same time it adds a hand written look to any font, which can be easily turned off if you’re already working with hand drawn type. Software requirements: Adobe Illustrator CS3 and newer. Will not work in any other graphics software. File size is approx 298.2MB (322.5MB unzipped), offered as a single download. Software compatibility: Software requirements: Adobe Illustrator CS3 and newer. Will not work in any other graphics software. Just wanted to let people know that I use this product on shapes in Illustrator all the time and it works just fine… it’s Graphic Styles and Actions so please don’t miss out on buying this thinking it is for text only. Thank you so much for taking the time to let the community know Julie, that’s super helpful of you! I absolutely love your Inkwell product, and would also love info on making AquaType work on vectors. Would Inkwell work the same way? This pack is designed specifically for type but I can definitely help you out if you need some watercolour effects for other parts of your work! Thanks for the comment and I am so sorry for any confusion with previous comments. This resource is for type only and will not work with vector objects- a different watercolour resource would be required for that. Hi, I am new to using both Adobe and Illustrator and having trouble installing this files. Could I get some more detailed information on how I can get this working? I am getting a message saying adjust image trace setting to that found in the instrustions then save that preset. Thank you so much for your comment! I’m really sorry to hear that you are having some trouble installing your Aquatype resources. Rest assured, I’m on the case to get you up and running again! I’ve sent you an email to investigate this further. I hope it helps, and please don’t hesitate to contact me should you have any other questions. I’m here to help! Can I use this on shapes as well as type? Thank you kindly for your comment! I’m really sorry but I’m afraid this item is for type only so it will not work for vectors. Rest assured though, we have some great resources available in our marketplace that will definitely be apply to apply this style to vectors 🙂 I’ve sent you a quick email to offer some suggestions to you! I hope it helps, Lorenza, and please do let me know if you have any other questions. I’m here to help! I would also like an email sharing links to pack(s) designed to apply watercolor to vectors and shapes like this does to type, thank you! Thank you for getting in touch! I can certainly help you out with your query 🙂 I’ve just sent you an email to assist you with this! Thank you kindly for getting in touch! I’m really sorry but this pack is designed specifically for type only so I’m afraid it will not work on vectors. Rest assured, I can certainly offer you some suggestions from our marketplace that will work on vectors for you 🙂 I’ve sent you an email to assist you with this. I hope it helps! Thank you for your comment! I’m just sending you a quick email to assist you with your query 🙂 I hope it helps! Hi! I’m interested in learning about getting this watercolor effect for my graphic elements as well. 🙂 Can you send me some information? Thanks! I would like to know how to apply these effects on vectors as well. Please could you email me as well? I would like an email about this too please. Thanks! I have just popped you over an email with some suggestions for watercolour effects for other resources :). I hope they help! How about me? Since you didn’t respond to my comment of two days ago, could you at least pop me out that email detailing how to apply the type effects to other vector objects, too? Thanks so much for the comments and my sincere apologies if we missed you out! It was a holiday weekend in the UK so we were on slightly reduced hours and are just getting back to everyone today- I am so sorry if you thought we were ignoring you! I have sent you an email now to help you out with your query and rest assured I am always here to help! Thanks for the comment and not a problem! I have popped you over an email to advise on getting watercolour for your graphic elements :). I would be interested in having this information via email as well. 🙂 Would be great to apply it to more than just type! Thanks! Can’t these watercolor type effects be applied to any vector object? Does type have to be live or can it be outlined? Thank you so much for your comment, I believe that the lovely Carol was able to assist you this query 🙂 If there is ever anything else that I could assist you with please do let me know. I’m always happy to help! Will the watercolor effect work in graphic images too, or just type? Thanks for the comment on this one! This pack is designed specifically for type but i can definitely help you out if you need some watercolour effects for other parts of your work! i have popped you an email to help out! Thank you so much for your comment! I can certainly point you in the right direction for some resources that can apply this effect to vectors 🙂 I’ve just sent you an email with some more information on this. I hope it helps, Oaker, and please don’t hesitate to contact me should you have any other questions. I’m always happy to help! Can you forward to me as well, the info on the pack that applies watercolor on vector images? Thank you! Thank you so much for your comment- I can certainly help you with this! Could I also get the information for applying the watercolor effect to vector images? Thanks! 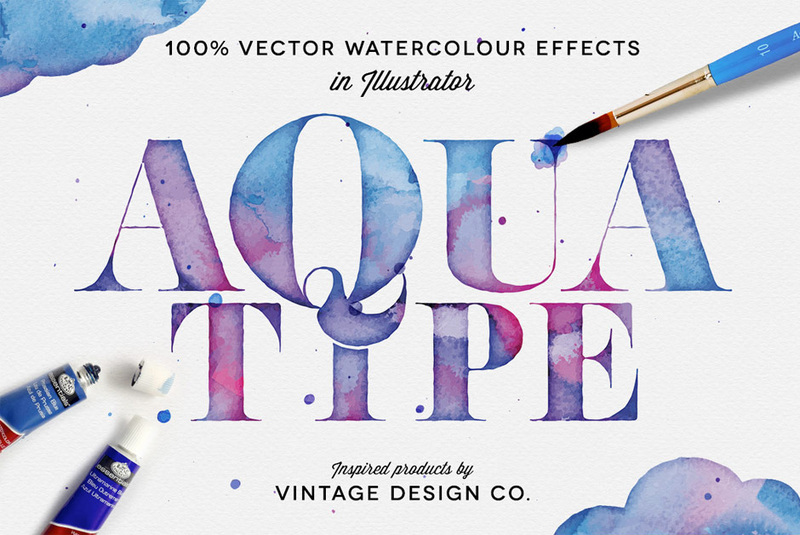 I’m really pleased you like the look of AquaType, it is an amazing & comprehensive watercolour kit. Vintage Design Co. did an incredible job with it!